James Cooksey Earp (1841-1926) – The lesser known older brother of Old West lawman Virgil Earp and lawman/gambler Wyatt Earp, James was a saloon-keeper and was not present at the Gunfight at the O.K. Corral on October 26, 1881. James was born in Hartford, Kentucky, and was reared in a tight-knit family environment. In 1861, at 19, he enlisted in the Union Army at the outbreak of the Civil War , joining Company F, 17th Illinois Infantry in May, 1861. His brothers, Virgil and Newton Earp, also enlisted. His service was cut short when he was wounded in the shoulder and losing the use of his left arm, in a battle near Fredericktown, Missouri, on October 31, 1861. He was discharged in March, 1863. Newton and Virgil served until the end of the war. After the war, he went with his family to California, before traveling to Montana, back to Missouri, and to Kansas. He married a former prostitute named Nellie Ketchum from Illinois in April, 1873 and the following year, the pair were living in Wichita, Kansas. In 1876, he headed to Dodge City, Kansas, where he became a deputy sheriff under Charlie Bassett for a brief time. He then began to roam through Missouri, Arkansas and Texas, working in saloons or as stage and wagon driver. In 1883-84, James was mining in Shoshone County, Idaho before settling permanently in California in 1890. 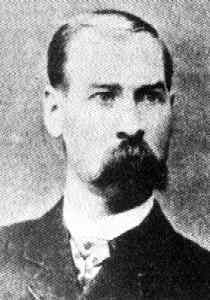 James Earp died of natural causes on January 25, 1926 and is buried in Mountain View Cemetery, in San Bernardino, California.